Heat oven to 325°F. Grease 1 1/2-quart ovenproof bowl (8 inches across top) with shortening; coat with flour (do not use cooking spray). Lightly grease 3 muffin cups in regular-size muffin pan. Make cake batter as directed on box. Pour cake batter in 3 muffin cups, filling two-thirds full. Pour remaining batter into 1 1/2-quart bowl. Bake cupcakes 17 to 21 minutes, bowl 47 to 53 minutes or until toothpick inserted in center comes out clean. Cool 10 minutes. Remove cakes from muffin cups and bowl; place rounded sides up on cooling racks. Cool completely, about 1 hour. If necessary, cut off rounded tops of cakes. Spoon frosting into large bowl. Add red food color to make desired pink color. Place bowl cake on tray cut side down; spread 1/3 cup frosting over cake. Use frosting to adhere cupcakes to bowl cake for feet and bunny tail. Use toothpicks if necessary. Place marshmallow halves, cut sides down, on tops of 2 cupcakes to make heels of feet. Spread thin layer of frosting over side and top of cake to seal in crumbs. Freeze cake 30 to 45 minutes to set frosting. Spread remaining frosting over cake. Sprinkle with 2 cups of the coconut; press gently to adhere. Shake 1 cup coconut and 3 drops green food color in tightly covered jar until evenly tinted. Surround bunny with tinted coconut. Use rolling pin to press strawberry candies into 2 large rectangles. Cut 2 large ovals and 6 small circles out of candy. Press onto bottoms of bunny feet, using frosting if needed. Roll up fruit snack to make carrot shapes. Cut green sour candies in half crosswise; press into large end of each carrot to make greens on carrot. Cut ears from construction paper; wrap ends that will be inserted into cake with plastic food wrap. Insert into cake. Remove ears, plastic wrap and toothpicks before serving. Store loosely covered. Need to bake cake layers in batches? Just cover and refrigerate batter in the mixing bowl while the first batch is baking. An extra minute or two for baking the second batch may be needed. 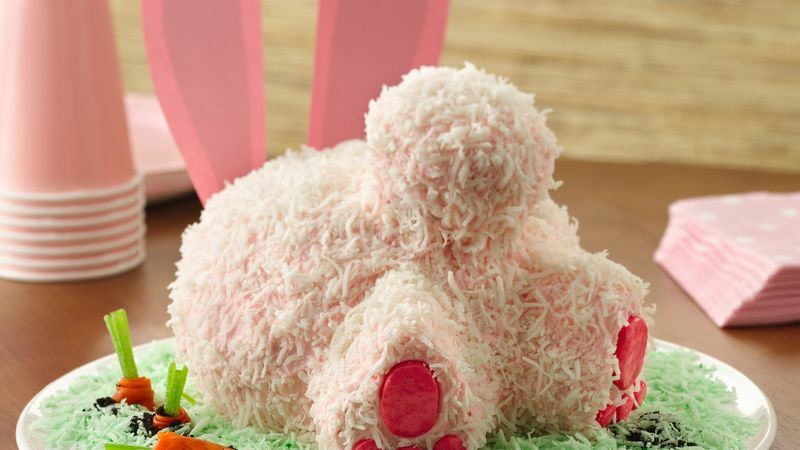 Sprinkle chocolate cookie crumbs behind the feet and around the carrots to make it look like the bunny was digging.